ST. BERNARD PARISH, Louisiana (CNN) -- "We were a normal red-blooded American family," recalls Rudy Aguilar. "And ... it took [one day] to wipe us out." 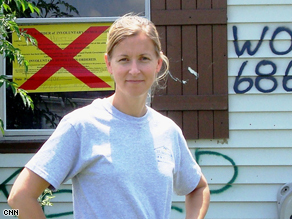 Liz McCartney moved to St. Bernard Parish to help residents rebuild their homes after Katrina. A lifelong resident of St. Bernard Parish, a community just east of New Orleans, Aguilar lost everything during Hurricane Katrina in August 2005. Nearly three years later, like many in his area, Aguilar is still struggling to get back on his feet. But now he has help. From her home 1,000 miles away in Washington, Liz McCartney was haunted by images of the storm's destruction and stories of people like Aguilar. In February 2006, she and her boyfriend, Zack Rosenburg, went to New Orleans to volunteer. McCartney said that when she first arrived in St. Bernard Parish, she was stunned. "We just wanted to pitch in and help out," McCartney, now 35, recalls. "I naively thought that six months later, you'd see all kinds of progress. [But it] looked like the storm had just rolled through." St. Bernard Parish was once home to 67,000 residents, but Katrina left nearly all of the area's homes uninhabitable. As McCartney got to know the locals, she was reminded of her parents and grandparents. "These were people who worked their whole lives, put their kids through college, and had never had to receive [help] before," she says. That's when she decided to do more to help the community recover. By June 2006, the couple had left Washington and moved to St. Bernard Parish. Neither knew anything about construction, but both felt they could use their experience raising money and organizing volunteers to help with the rebuilding effort. Local residents, touched by the couple's leap of faith, taught them basic construction. Within two months, McCartney and Rosenburg opened the nonprofit St. Bernard Project, which focuses on helping those they consider most in need -- senior citizens and families with children. The formula is straightforward: With donations, volunteers and skilled supervisors, homes get rebuilt -- and people move home. "It's not rocket science," McCartney says. "The problems in this community are widespread, but the solutions are really simple." Yet this simple equation yields impressive results. The St. Bernard Project can transform a gutted house into a livable home in just eight to 12 weeks for an average cost of $12,000. For residents like Aguilar, the St. Bernard Project has been a lifesaver. In the years since Katrina, he lost his job and struggled with health problems. "I was so beaten down," he says. "I was gonna blow myself away." To date, more than 6,000 volunteers have worked with the St. Bernard Project, enabling more than 120 families to move back into their homes. McCartney says every house her group rebuilds has an impact on the community as a whole. "Once you get one family back, other families are willing to come back as well," she says. "There's a very nice ripple effect." McCartney and Rosenburg plan to keep working until all the homes in St. Bernard Parish are rebuilt. For Aguilar, McCartney isn't just rebuilding homes -- she's restoring a sense of hope to the community. "Little by little, one house at a time, we'll be back," he says. "I feel it. I know it."